I didn’t think this was going to be difficult. 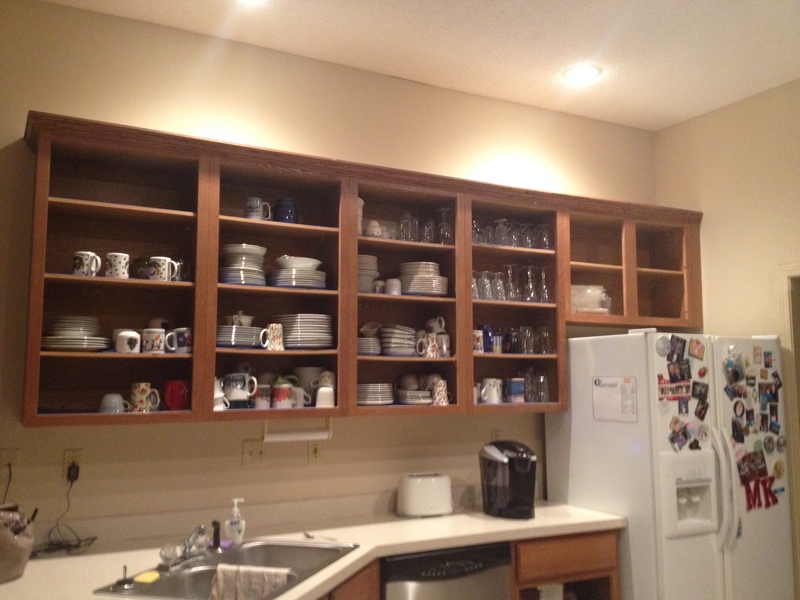 How hard could it be to just repaint the cabinets? I soon discovered there’s more to this than I had originally thought. 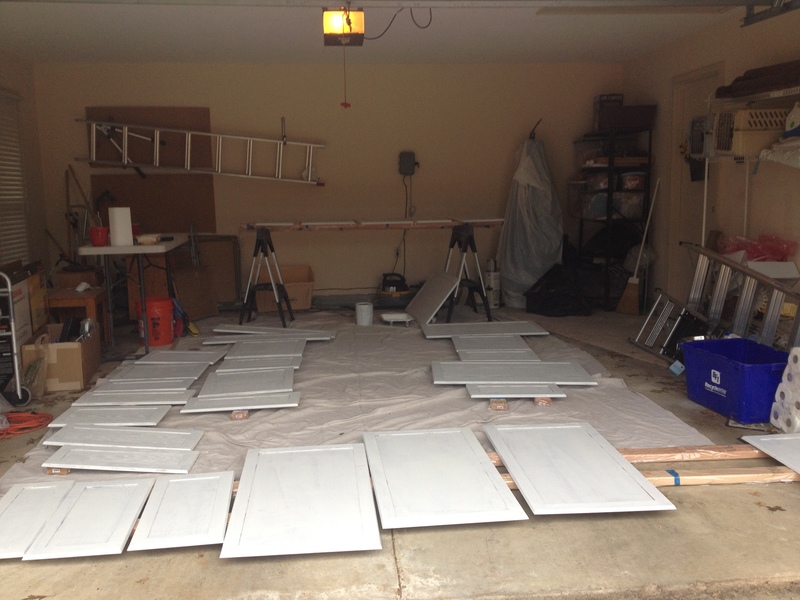 They have to take the cabinet doors off, clean them, sand them, prime them, prime them again, and then paint them (I’m not sure if it will be one or two coats). They’ve set up my garage as the workshop for this project. I’ve learned several spiritual lessons from this scenario. First, I had to empty out all my drawers. And even though I didn’t have to empty my cabinets, I decided I wanted to straighten things up a bit before they took the doors off. Oh, my. . . I was shocked at how much “stuff” I have accumulated over the years. My first thoughts were, Why didn’t I clean and purge a little at a time instead of letting things build up and then be overwhelmed by how much “stuff” was there? In the same way, we need to keep short accounts with God every day and not let sins accumulate as we ignore or put off dealing with them till a later day. When that later day comes, it’s overwhelming because we’ve let the sins accumulate and it’s too much to deal with all at one time. I learned a second lesson when I walked into my kitchen after work yesterday. All the cabinet doors were off, and everything that had once been behind those cabinet doors was now open and exposed for all to see. I actually saw things I didn’t know were there until the doors were off. I had forgotten about them. This morning I was thinking how this is true of the way God sees us. We may try to hide things in our lives “behind closed doors,” thinking no one will see them because they’re hidden. But God sees everything in our lives. There are no “cabinet doors” hiding things from God. I am exposed. I can’t hide anything from Him. I can’t hide my thoughts, my pride, my selfishness, my insecurities. . .
Hebrews 4:13 reiterates this: “And there is no creature hidden from His sight, but all things are open and laid bare to the eyes of Him with whom we have to do.” He sees it all. It was a good reminder to me this week that God knows me inside and out. He wants me to be honest with Him about what’s going on inside and not try to hide things. He knows and He wants me to acknowledge to Him what’s behind my “doors.” He sees my inmost being. And to be honest, I’m glad. It frees me up to accept His love and mercy and grace. Has God taught you some spiritual lessons from the process of remodeling your home? I’d love to hear from you. NextAre Mentoring and Discipleship the Same Thing? Hey, Crickett! A lesson I’ve learned through my cabinets is about clutter. On more than one occasion, I’ve opened my cabinets to “clutter.” Multiple times when I have prayed about adding a service, a new disciple, a new venture (like a job or starting my own business from my home), a new responsibility at church or boys’ school, God reminds me of those cluttered cabinets. Some times His answer to me was that the request I took before Him would “clutter” my life and my schedule and I would get the mental picture of a cluttered cabinet. When His Spirit gently reminded me of cluttered cabinets, I knew my answer to the request was a clear no, even if I really wanted a yes. It’s sweet, really, how God’s Spirit whispers to me when I ask. Ashley, thanks for sharing this lesson. I love it! I need to remember that when I am considering adding something new to my life. Will it clutter my life? Great insight. Miss you!